Recording artist Whitney Houston began her record-setting career with the best-selling debut album ever released by a female singer. Born in East Orange, New Jersey on August 9, 1963, she was groomed for stardom at an early age. Her mother was the famed gospel artist Cissy Houston, and her cousin was pop singer DIONNE WARWICK. Family friends included ARETHA FRANKLIN, Roberta Flack, and Gladys Knight. In her teens, Houston began her professional career singing backup for the singers Chaka Khan and Lou Rawls. Her beauty and lean figure also won her modeling work, including appearances on the covers of Seventeen and Glamour magazine. Houston dabbled in acting as well. She made numerous television commercials and played small roles on the situation comedies Silver Spoons and Gimme a Break. At 19, Houston was signed to Arista Records by president Clive Davis, who was known for his careful nurturing of talent. For two years, she and Davis workfinow,” “The Greatest Love of All,” and “Saving All My Love for You,” for which she won a Grammy Award for best pop vocal performance. Not all critics, however, were enthusiastic about Houston’s triumphant appearance on the music scene. Her detractors complained that her voice, through technically fiawless, showed little true emotion. 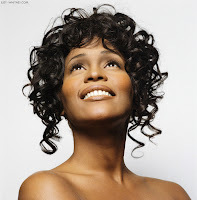 For the next two years, Houston toured and developed material for her second album, titled simply Whitney (1987). It became the first album by a female artist to enter the charts at number one. Houston also scored four more number-one singles, including “I Wanna Dance with Some- body” and “So Emotional.” Her next album, I’m Your Baby Tonight (1990) went triple platinum, yet it was considered a disappointment because its sales were not as phenomenal as its predecessors. 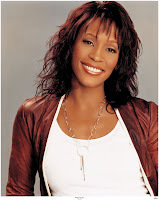 In July 1992, Houston married recording artist Bobby Brown, with whom she had one daughter, Bobbi Kristina. The same year, she made her acting debut playing a singing star in the romantic thriller The Bodyguard. The film was an international success, earning more than $400 million worldwide. Just as sensational was the response to the movie’s soundtrack album, which featured six songs by Houston. The best-selling soundtrack ever, the album included the DOLLY PARTON–penned love song “I Will Always Love You,” which became the biggest hit of Houston’s career. Houston continued acting in the films the hit Waiting To Exhale (1995) and The Preacher’s Wife (1996), which proved one of the few failures in her career. In 1997, she also starred in Cinderella, a highly rated television musical in which she played the Fairy Godmother. Houston unveiled a new sound in 1998’s My Love Is Your Love, her first album in eight years. Moving away from the pure pop that made her a star, the recording showed Houston experimenting with hip-hop and with rhythm and blues. It also featured Houston singing with several younger artists, including Missy Elliot, Faith Evans, and Lauryn Hill. Although beloved by legions of fans, Houston has been the subject of tabloid gossip, often focusing on the drug use of her husband. In 2000, Houston herself was charged with marijuana possession in Hawaii (the charges were dismissed the next year). She also drew harsh criticism when she was pulled from performing at the 2000 Academy Awards ceremony because of her erratic behavior during rehearsals for the telecast. Houston, did see one triumph that year, however—the release of Whitney: The Greatest Hits. The briskly selling career retrospective showed that her private problems had done little to diminish the public’s enthusiasm for her work. Bowman, Jeffery. Diva. New York: Harper, 1995. Cox, Ted. Whitney Houston, Philadelphia: Chelsea House, 1997. The Bodyguard (1992). Warner Home Video, DVD/VHS, 1997/1999. Whitney: The Greatest Hits. BMG/Arista, DVD/VHS, 2000/2000. Whitney: The Greatest Hits. BMG/Arista, CD set, 2000.